View of a people walking along a narrow street with storefronts on either side. Building to the right has large columns and may be a theater or opera house. 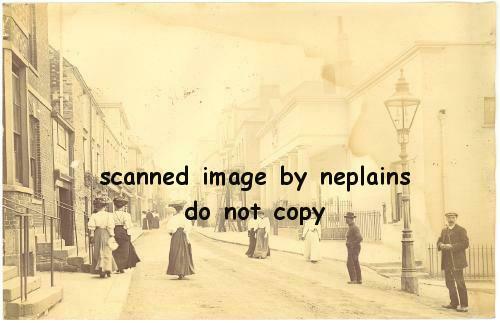 Location of this view is unknown; the photo was found amongst other items from Cornwall, England. Measures approx 5-5/8 x 3-5/8 inches. Minor corner wear. Faint stain along top and right edges.